I recently wrote a blog post about the importance of having savings in your youth, to give you the freedom and means to spend your youth as you want. Personally, I’ve decided to spend a certain chunk of my savings on the 2-year Master’s degree I’m currently doing, but I have also learned a lot about how to finance a Master’s degree and how to keeps costs down – something that I myself have had to put a lot of thought into over the last year. Tuition fees for Master’s degrees differ by subject, by university and by duration, and they can be notoriously expensive. Lots of the humanities Master’s in the UK that I looked into cost between £10-15,000 per year, however some specialised and executive degrees such as MBAs can cost around £50,000 per year. You may feel that the reputation of the university may warrant the high price tag, but before you commit to such a large expenditure, speak to people in your desired career and find out just how useful and essential that specific course will be – is it worth the price tag? Also ask the course co-ordinator or admissions tutor about the number of contact hours and exactly what you’ll get for your money. Sometimes you can also get a discount on your tuition if you’re returning to the university where you got your Bachelor’s. The main thing to know here is: start early! By the time I got around to researching scholarships when I received my offer, I had already missed most of the deadlines! Start early, at the same time as you make your Master’s application, The university offering the course will usually offer some scholarships for particular social groups or people from certain backgrounds or nationalities. The course co-ordinator should know about the most relevant funds you can apply to, inside and outside of the university. In my experience of researching scholarships, the rarer and higher in demand your subject (eg. sciences, STEM subjects) then the more scholarships there are on offer. Humanities are trickier. You can also try search engines or lists such as this one by Top Universities, look into the relevant research institutes or academies for your subject, or even try charities not-for-profit organisations like Rotary International who will apparently sponsor a certain number of students per year. I also entered a number of competitions for Master’s students, such as this one by Find A Masters – with no luck however! If you don’t manage to secure any scholarships or grants before you start then don’t despair entirely, as at some universities there are even funds which you can only access once you’ve enrolled and begun your course (eg. Erasmus grants for spending a semester abroad, grants for high grades, funding through student societies and associations or from alumni pots). Lots of scholarships are restricted by nationality, with priority for citizens of developing countries, who otherwise couldn’t afford the cost of a Western education, or with priority for strategically picked emerging economies with the aim of building intercultural relations. As as a Brit, I myself wasn’t eligible for these scholarships so I have limited knowledge of the relevant sources, but look at the official agency that promotes higher education in your target country (e.g. Study in Holland or Study in Sweden as examples) for more information on these government-run initiatives. In 2016 the UK government introduced the new Postgraduate Loan, which allows you to borrow up to £10,280 to complete a postgraduate course, on similar terms to the undergraduate student loan. So it typically has lower interest rates than a normal bank loan, it is paid back only when you earn above £21,000, it can be paused while you’re not working, and it doesn’t count as a debt in your credit score (which is important if you’re thinking about getting a mortgage anytime in the next few years). While this might not cover everything, it’s a damn sight better than a bank loan and finally recognises the benefit that postgraduate qualifications can offer to the national workforce. Sadly though, it’s only available to you if you’re studying at a university within the UK. There is also the government-run Professional and Career Development Loan, which allows you to borrow up to £10,000 for courses, although it has specific eligibility criteria. There may also be other student loans offered by banks, but make sure you get plenty of independent advice and research it well before you commit to one of those. (Also, if you’re still paying off your undergraduate UK student loan, make sure you inform the Student Loans Company that you’re returning to study, so they pause your undergraduate repayments while you’re not earning). It also might be worth asking relatives if you can take a loan from them instead of from a bank, just to avoid the damage of having a bank loan on your credit score. Tuition fees abroad can vary considerably, but if you’re an EU citizen then you can pay significantly less outside of the UK! It ranges from zero tuition in countries like Sweden, Finland and Denmark (yes really! ), to very little in countries like Germany and France (c. €200 for admin costs), to a little more in the Netherlands (c. €2,000). Here is a good overview and comparison of the different tuition costs across Europe. It demonstrates how the UK has the highest tuition fees of the entire region, so it’s understandable that British students would look abroad for English-language Master’s programmes. (NB. Once Britain leaves the EU, British citizens may no longer have access to other EU countries’ national tuition fees, in which case Brtis would have to pay much higher tuition fees abroad – another reason we should be staying in the EU!) For certain Masters that are supported by the European Commission, there might also be tuition fee waivers. In my case, by applying for a waiver I received a 30% discount on my tuition. On the other hand, the cost of universities in the Unites States makes the UK look cheap in comparison! Master’s courses in the US can cost a phenomenal $30,000 per year, and even go up to as much as $200,000 for a 2-year MBA! Each country will have a different student loan or grant option, which may or may not be available to foreign students as well, so you’ll need to research that quite thoroughly, but don’t automatically expect to be able to receive the local students’ same loan or grant for the government. Living costs really depend on where you are living and what sort of lifestyle you lead. Understandably, capital cities are the most expensive places to live, and are actually not very student-friendly in my experience. Smaller university cities can often be far better for students as rent, shops, bars, etc. are all tailored for students. That academic vibe and student community is more present in a smaller city that’s dominated by the university (such as Exeter, Durham, Groningen, Uppsala, etc.) and it allows students to integrate much better than in a big capital city that caters for a salaried person’s lifestyle. In a smaller city where you can walk or cycle everywhere, you also eliminate transport costs. Accommodation: You probably don’t want to slum it during your Master’s and live in student halls again, where 18-year-olds party every single night, just like you did back when you were a fresher. But neither do you need a super luxurious flat in the best location. If, like me, you’ve been working for a few years after your Bachelor’s and living a salaried lifestyle, then you might need to reset your expectations and lower your standards for a year or two while you’re studying, but it really isn’t the end of the world. The good thing about being a student is that you’re rarely at home anyway – you spend your time at the university, in your student union or associations, in the library and at friends’ places, so your home environment doesn’t need to be the haven of refuge that you needed while you were working. Try out some cheaper accommodation and your savings will honestly thank you later. And if you’re really not keen on it, just remember that it’s only temporary while you’re a student – it’s not forever. Travel and holidays: The good news is that you’re free of annual leave and able to travel whenever you don’t have lectures! You can take advantage of cheaper midweek flights, you don’t have to ask anyone’s permission to take time off, you often have ‘reading weeks’ and you’re surrounded by other students who are also free to travel as they please! The bad news is you no longer have so much disposable income to pay for all that travel in the first place. Which is where you have to get even thriftier. I’ve a whole blog post coming soon about saving money while you travel, but rest assured it is still possible – you just need to pick your destinations carefully. Student discounts: Primarily for transport, this discount is a godsend. One way to fund your studies is to work simultaneously. While you can of course work as a bartender, waitress or shop assistant, I’d advise you to think about your high-value skills that can earn you a lot of money in less time. For example, if you speak English natively while in a foreign country or if you have a specialised subject or skill that you can teach to others, then 1-to-1 tutoring can be a far more lucrative option than the hospitality or retail industries, as well as looking better on your CV. By focusing only on high-value work, you can work fewer hours and have more time for studying and enjoying life. I used to tutor English to Spanish children while doing Erasmus in Spain a few years ago, and in the Netherlands I ran workshops on blogging, both of which are better earners than restaurants or bars. Many Masters courses in the UK are also available as part-time programmes, typically taking double the time to complete, but only requiring you to study in evenings, weekends or 1 weekday per week, which allows you to maintain your existing job and salary. This is how most non-Masters professional qualifications are obtained, and I have to say that I really admire anyone who manages to study such intense courses alongside a full-time job. It requires a lot of commitment and willingness to sacrifice your spare-time and weekends, but can be a great option for those who don’t want to leave their current jobs to gain a Master’s. By keeping your existing job, you may also be able to ask your employer to contribute towards your tuition fees, or take advantage of any ‘matched learning fund’ to pay for your course. Not many Brits know what Erasmus is, let alone the fact that you can do it at both Bachelor’s and Master’s levels, while receiving a grant from the European Commission to do so. Amounts vary per university and per the cost of living in your destination country, but I for example currently receive €270/month in Erasmus grant. 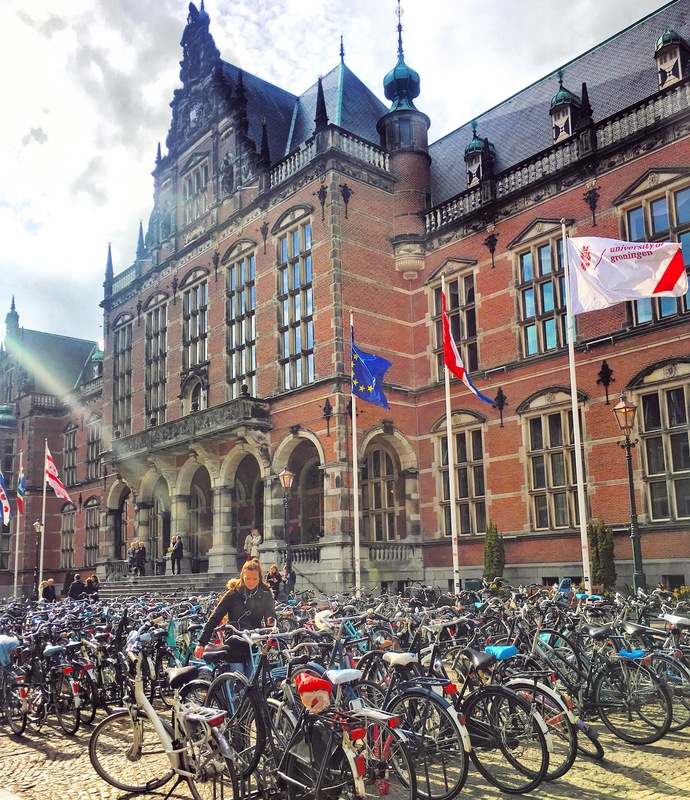 My university (and others) also have additional funds that you can apply to for additional grants for studying abroad: either €400 or €1,000 at the University of Groningen for example. Also, if you choose to study abroad in a much cheaper country, then you will save on living costs as well. In the end, it’s a matter of combining lots of different sources of funding and being canny with applications. In my case, I support myself through a mix of loans, savings, income from occasional work, Erasmus grants, consortium grants, academic achievement grants and a partial tuition fee waiver. By the end of my Masters, the mix of grants, scholarships and tuition waiver I receive will effectively cover my tuition entirely, and I will only have spent my loan, savings and earnings on my living costs. So hopefully this shows that a Master’s can be relatively affordable and that it doesn’t have to be a huge financial investment only open to a select few. Good luck to everyone applying for scholarships and grants, and I hope this post helps you in financing your Master’s! Do you know of any other funding sources or scholarship providers? Please do comment below to share these opportunities with others. And can you add any other tips for funding a Master’s degree? Thanks for breaking it down, Virginia! I’m looking into Translation Master’s and currently my best option is looking like doing a part time, distance Master’s from Bristol so I can keep up with my freelancing whilst I study, but I’ve been slacking on looking into scholarships so that’s now on the to-do list! Hope you’re looking forward to your semester in Mexico! Good luck with the scholarships and the Master’s in general too – I’m very impressed by anyone can combine studying and working at the same time. But great that you have the opportunity to! And glad the post is helpful. This is a really helpful guide, I’ll keep your advice in mind if I decide to pursue looking into Master’s programmes (either UK-based or abroad). I’ve been in two minds over whether or not to return to studying, but I think I need to take a little more time to weigh things up – even with all the grants etc. that are available, it’s still a considerable investment (of both time and money). Hope everything is going well with you in Sweden! I’m glad this post helps, and it’s definitely important to be realistic about the costs of doing a Master’s. Take your time to decide, but of course remember that “if” studying in the EU suddenly becomes more expensive for UK citizens in a future post-Brexit world, then it could become a considerably bigger investment if you wait a few years. I’m still hoping that Brexit will somehow be reversed and all this mess will go away! And I hope you’re well too! Thanks for this great advice. If you have any advice for Post-doc funding I’d love to hear about it. I’m afraid I’ve never done any research into post-doc funding as I’m a long way off being a post-doc – apologies I can’t be more helpful!